Just as we were about to leave the place, I noticed a huge copperhead laying in one of the flower beds in the yard. “Well”, I thought, “I don’t need to leave this thing here with the possibility of it scaring or biting someone!” I did not want to make a scene of killing it with the owner standing over in another part of the yard, so I decided to just quietly catch it and haul it off. 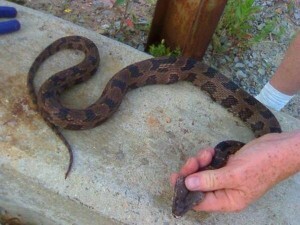 As an ole’ country boy, I had caught copperheads before. I got a hoe off the truck and went over and slowly eased it up behind its head and put pressure down on it so it could not escape. With its head held down securely, I reached down and firmly grasped it right behind the head. I released the pressure of the hoe and picked him up and headed to the truck. I got in the passenger side of the truck and told my co-worker, “Let’s go”. About that time the owner saw we were about to leave, so she called my name and started coming over to the truck to talk to me about some more things that needed to be done in the yard. Not wanting to cause any commotion, with a tight grip on the snake, I lowered it down between the seat and the door, hoping there would be no request for me to go look at something, thus having to make my exit from the truck. She came over to the truck right to the open window, and we safely had our conversation because I was committed to holding on no matter what. There is a lesson in dealing with a poisonous snake like that. Once you commit to catching it, you must hold on tightly. That is your protection. If you hold it loosely or if you half-way release it because of its strong writhing and quick jerking movements, you could end up getting bit. Total commitment is a must.